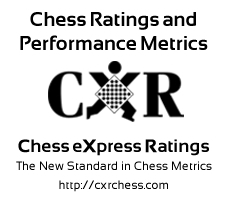 Rating Adjustments are made by agreement between player's affiliate and CXR, when the prevailing evidence supports its advisability. "Ryan Amburgy has had more success playing the White pieces. With the white pieces, he plays very well against strong opponents. Rating seems to be seeking a higher level. Greater success with White implies the potential for improvement with Black. Concentrate on opening moves for defense. Ryan has faced opponents with an average rating of 1122.6. Ryan should seek opponents of equal or greater strength in order to improve. He has improved by 1562 points since 2013-10-19. "